So our dear 老大 just launched his film debut! 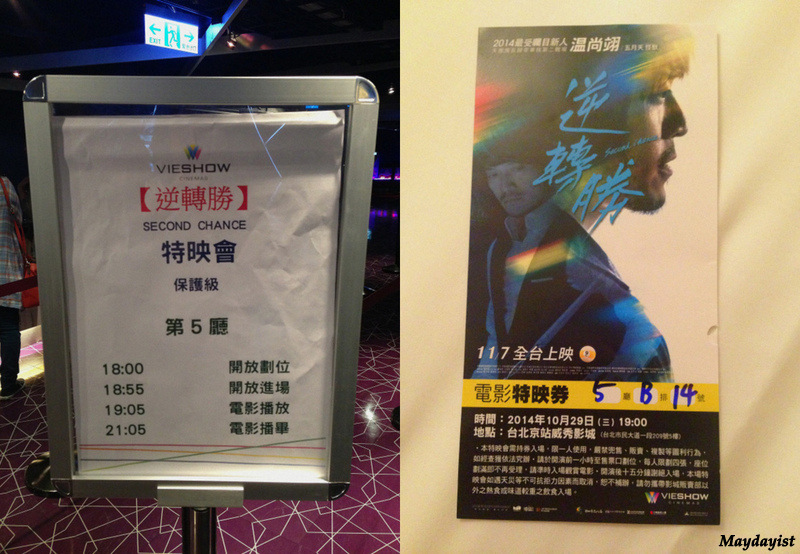 The film will be shown officially in Taiwan on 7th November 2014. It will be shown in Singapore eventually (hopefully by end November). to the newly released 九號球 theme song sang by 老大 and the fantastic soundtrack. By sheer shamelessness and luck, I miraculously managed to secure two complimentary tickets for the special screening of the film in Taipei on 29 October 2014. I was shocked by the generosity of the organisers and magic power of my lucky stars. Holding the tickets like trophies, I dragged my clueless sister to Vieshow cinema (near Taipei Main Station) for the film premiere! I had the illusion that the premiere screening will be a grand ceremony with red carpets, reporters and even 老大’s special appearance. When we reached the cinema, only this nondescript sign greeted me. Disorientated by the lack of “welcome”, I headed to theatre 5 directly. Just as I was expecting to be guided to my seat like a VIP, the usher informed me that I had no seat numbers. After a great deal of confusion, I realised that I had to 劃位 first. It basically meant that I was supposed to go to the normal ticketing booth and the ticketing assistant will assign and write the seat numbers on my tickets. Anyway, I eventually managed to get not very desirable seats (second row from the front, near the right corner). Well, I have to admit that I am a harsh film critic. Thus, I was not expecting much (other than a mainstream film catered to the fans) when I attended the theatre. I guess it is not fair for me to give a critical analysis of the film since I am a biased fan and a firm detractor of mainstream films. So I will just try list some things I like about the film and some areas which I think can be improved. 1) 老大! 怪獸! 溫尚翊! 謝雙丰! The best part of the film is obviously the male lead! Our dear 老大 showcased his acting prowess in the film! I am pleasantly surprised that 老大 can act pretty well (considering that this is his first film debut). 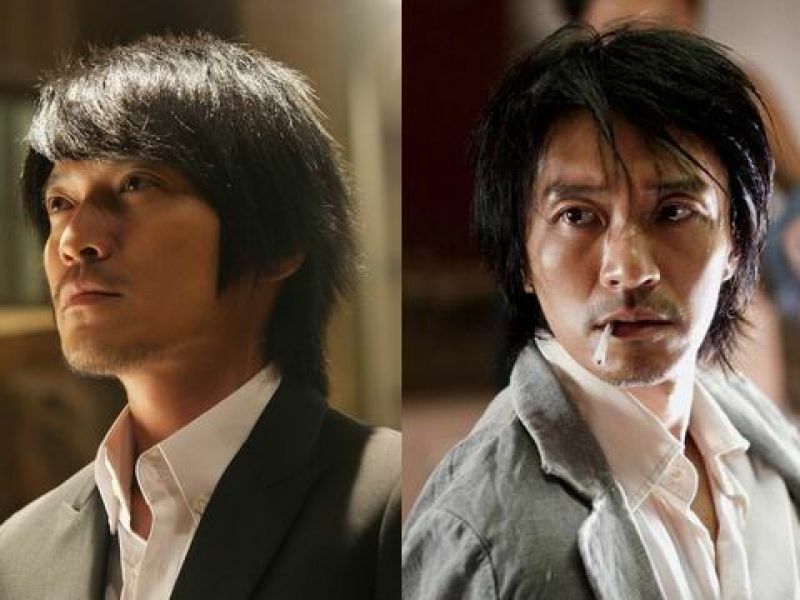 Despite 老大’s uncanny resemblance to Stephen Chow, he injected his own 浪子/rebel style into his big screen role. During the interviews, he said that he had intensive acting and pool / pocket billiards classes. Indeed, the audience was rewarded by the fruits of his labour. His acting skills as a professional pool player was pretty convincing. Of course, 老大 was very charming in the film (even when he engaged in unhygienic acts like digging his nose) ! Huang Peijia who acted as 謝雙丰’s niece is a pretty girl. Her legs are super long and slim. She used to be a professional dancer – that explains why her legs are so beautiful. She can also act competently. Of course, she provided much “eye candy” moments on screen. 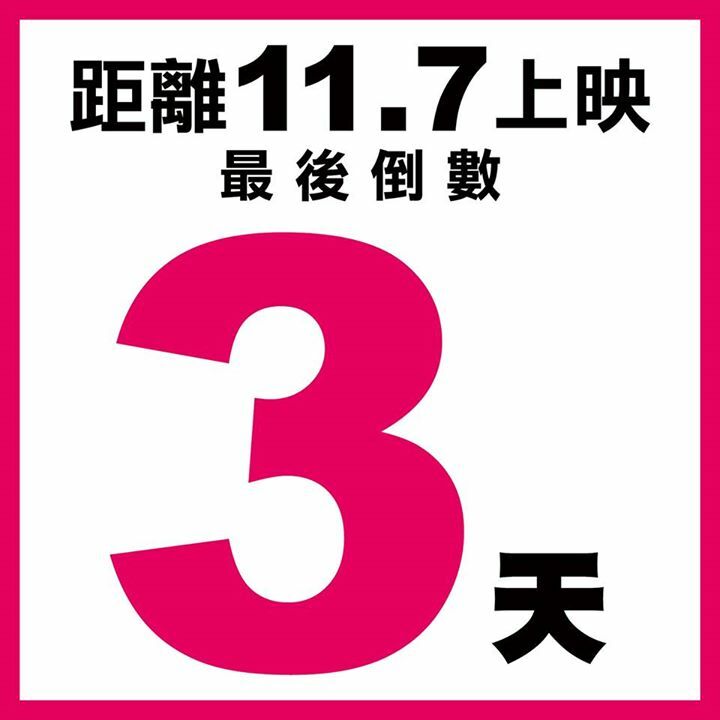 老大 sang a new version of 九號球 – the theme song for the film. 老大 is not the best singer in the world but his efforts at singing solo / carrying his own weight in the music video is highly commendable. He even managed to invite the famous Japanese guitarist, Tak Matsumoto, to play the guitar solo segment in the song. He was also the music director for the film. I heard remixes of my favorite 老大-composed songs in the film – like 亂世浮生 and 牙關! I can’t wait to listen to the full soundtrack! Bin Music uses this opportunity to release a special soundtrack/Monster’s music CD combo. The soundtrack consists of 2 CDs. The first is the soundtrack of the film. The second consists of 17 songs composed and personally selected by 老大. The film was directed by Wen Yen Kung (孔玟燕). He is a young director who produced Mayday’s “追梦3DNA” movie and “偌亞方舟” music video. I think the pool playing action scenes were well shot. 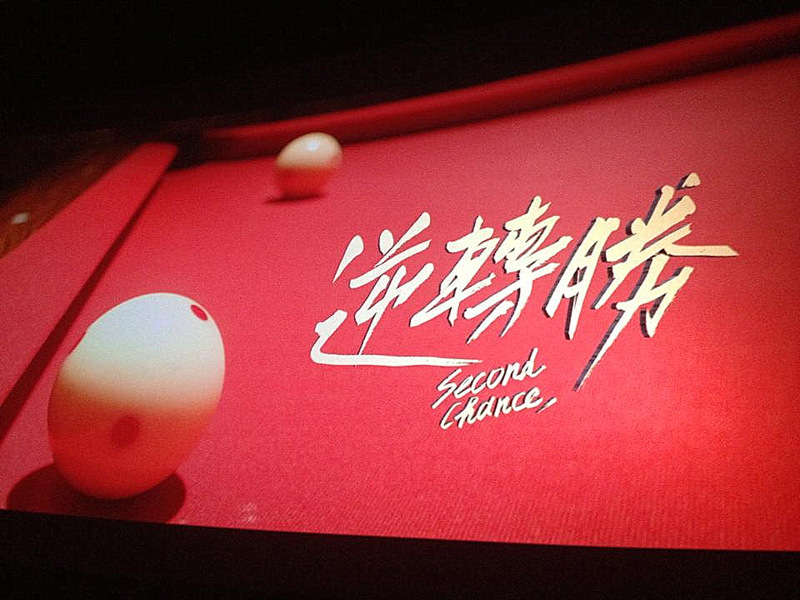 With the accompaniment of 老大’s music arrangement, the director captured the tense atmosphere during the pool competitions. Apparently, the pro players in the film are real experts. An international pool competition was held in Taiwan when the film was being made. Hence, the pro players were invited to be guest performers in the film. With a runtime of 110 minutes, the script must be written concisely to convey a convincing story. I think my sister was bored halfway through the show as the plot was not that captivating and 老大’s charisma did not work on her. The feud between 謝雙丰 and 王識賢 was not explored deeply. The hero vs villain plot was used rather superficially. The villain became just a convenient one-dimensional mechanism for the plot. 老大’s character was not properly developed. 謝雙丰 was portrayed to be an alcoholic who used to be a top pool player. He needed a more credible backstory for the audience to empathize/sympathise with him. What actually caused him to make such a risky gamble with his enemy? What (trials and tribulations) did he undergo when he was in the run? The director/scriptwriter depended on too many shortcuts which undermined the realism of the story. For instance, 謝雙丰 decided to coach his niece pool without much hesitation. And the niece mastered the skills too quickly. It was not that plausible for her to attain a professional player’s level of skills in that short period of time. Well, unless she was a very talented player who was coached by her father/uncle (then more time can be spent to explain that story arc). Furthermore, 謝雙丰 seemed to have overcome his alcoholism too easily/quickly. The complex relationship between 謝雙丰 and his niece 小香 offered ample opportunities for interesting dynamics to be developed. Unfortunately, in the film, the relationship between them was examined but not sufficiently. There was a brief scene which showed the interaction between the uncle and niece in the past. However, that scene was too brief to fully explain how the uncle played an important role in the niece’s life and how the niece was affected by the uncle’s sudden disappearance. Perhaps more screen time could be devoted to intimate conversations between the duo to showcase the complexity of human emotions and familial ties. Or more thought-provoking dialogues could be inserted into the screens of them playing pool together. Another missed opportunity for character development was the relationship between 謝雙丰 and and his ex-lover 姚安琪. The almost non-existence romance was a distraction in the film when it could be more effectively utilized to add more depth to the characters. Overall, anchoring on Monster’s star power, the film is clearly made for the fans. The film is perfect for a fangirl-popcorn-sharing session. Instead of spending money on yet another conventional Hollywood blockbuster, why don’t you spend your money on a feel-good Taiwanese production and support our talented musician-turned-actor, 老大? So I think 老大 has the potential to pursue a movie career. What do you think? Hopefully, he may get better scripts which will do justice to his improved acting skills! Some videos for those who cannot wait to watch the film!